Personalized, Caricatures, and Art Commissions Available! Rbitencourt was originally created in Brazil in 2005 as a street vendor. We started this company from scratch. My mother (Rita Bitencourt) originally worked in politics at the City Hall in Itajuba, Minas Gerais, Brazil and on her leisure time, she would create and sew bags and purses for herself to take to work. As time progressed, people at her work started to notice her crafting skills and ask if it was possible to make this or that bag so they could also use them at work. Me, Elisa Bitencourt, a geek and gamer by nature, addicted to anime and mangas, always loved to draw (I would do them during classes on the school desks and chairs), so one day I came up with the idea that I also wanted to learn how to sew. And that is how EVERYTHING started! Then I met my husband, Robert Evans (I met him in an online game - just as an extra information) while he was living in London working as a Commodity Broker (he went to CISI - The Chartered Institute for Securities & Investment). Some months after. he flew to Brazil and, while living together there, he got involved in the company. Time went one and we decided to move back to his home country, USA, then the idea of creating a Rbitencourt USA came up. He got us our international Trademarks and Patents, and the rest is all you can see! *COMMISSIONS CLOSED* *CONTEST OPENS*Hey guys, so I'm not taking any more commissions, but, I'm doing a super fun contest! 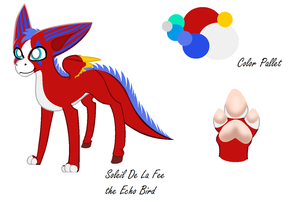 How to enter Contest: If you draw my character Soliel De la Fee, and you send it to me in my comments. 1. It must be done within the time slot. 2. It must be Soliel De La Fe. heyy sorry for the late notice, but for the ! Thanks so much for the Llama! Here's one for you!